Editorial note: This press conference was held 24 days after the launch of the Anglo-American-led invasion of Afghanistan. 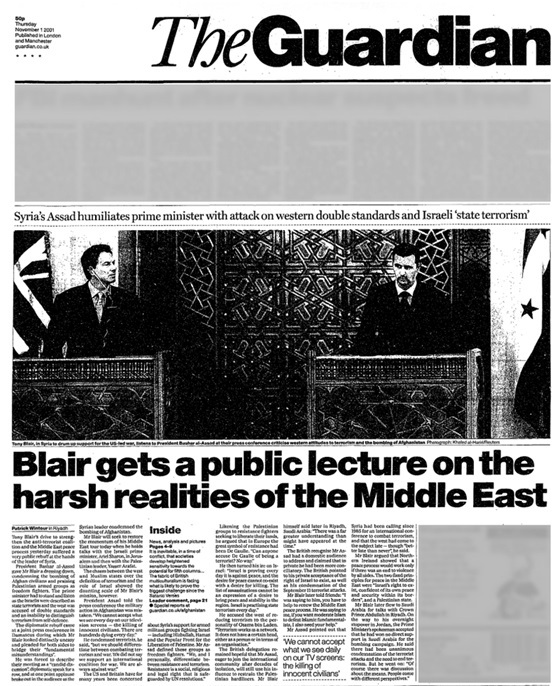 PRESIDENT ASSAD (via interpreter): I am welcoming Mr Tony Blair, the Prime Minister of Britain and the accompanying delegation in Syria and I would like to indicate that it is the first visit of senior British officials at this level since the independence of Syria in the 1940s and certainly before then, decades before then, and this has many indications and many importance and many meanings and it indicates the development of the relations between Syria and Great Britain. Despite the fact that the visit is very short the talks were very rich and we had time to discuss many issues and many topics. We agreed on many of the analyses that we discussed in the talks and there were many points of understanding and there was also some points that each undertook to the other. The main issues that we discussed during these talks, of course we concentrated on the issue of terrorism and the peace process and the Middle East, of course. 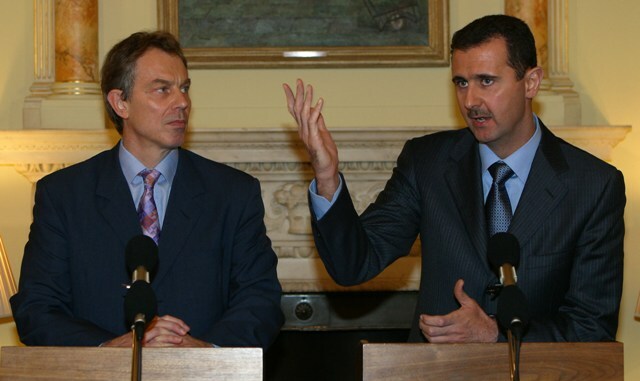 We talked quickly about the bi-lateral relations and we agreed to consolidate these relations through the ideas which were discussed between Syrian and British officials whether in Syria or in Britain. As for the issue of terrorism, there was a sound condemnation of what had taken place on 11 September in the United States and, I think this goes without saying, I don’t think there is any country in the world that would say it agrees with terrorism. It is a principle for all countries. 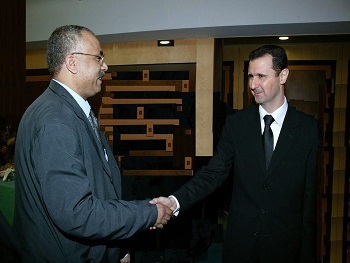 But the condemnation that Syria has announced was not only a result of what had taken place on 11 September, but it is an outcome of our principles, all the principles throughout our history in Syria, social principles, it was an outcome to our religious principles that are here in our Arab region, whether as Arabs or as Muslims or as Christians. It is a result of our suffering from terrorism, especially during the mid-1970s and the consequent period, and of course, at the same time, we differentiated – and I personally differentiated – between resistance and terrorism and between Islam and terrorism. There is a difference between resistance as a social right, as a religious right, it’s a legal right, and it is a right that is safeguarded through the United Nations’ resolutions. Of course Islam and all holy religions have the same source and they were sent to people by the same God. These religions were not sent for war but they were sent for peace and for the combating of terrorism. We talked about the root causes of terrorism and I mentioned many causes. But I mentioned particularly one important cause of terrorism and it is a reason that many citizens in the Arab or Muslim regions feel; it is a feeling of the difference and the human value between the citizen in this region and the human values of the citizen in the West. 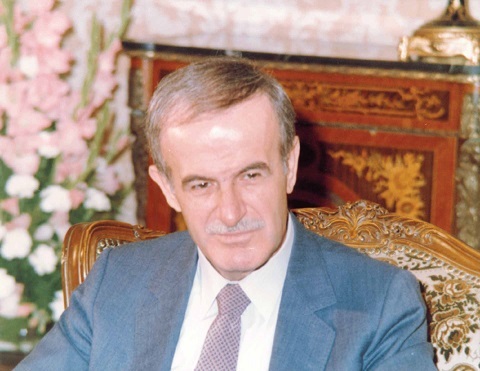 Especially as terrorism is there for a long time in Syria, since 1985, the late President Hafez Al-Assad sent Syrian senior officials to Western European countries to ask for convening an international conference to combat terrorism. So the issue of combating terrorism is very old for Syria, and although the combating of terrorism came quite late, it is better late than never. The important point is that combating terrorism should have started before, and many people in the region feel there is a gulf that the Western people should fill, that the human person is a human person anywhere and terrorism is terrorism anywhere, whether it is in the Middle East or Europe or in Asia and everywhere in the world. We spoke about combating terrorism and I said that combating terrorism should start by defining this again. We can’t fight an enemy without knowing who this enemy is, what shape is he, where is he, is he North, East, West or South. We have to define our enemy first and we have to specify its appearance and its existence and then we have to analyse the reasons which brought this terrorism. Therefore, in order to combat terrorism, we have to address the root causes and not the effect. Until now only the effects of terrorism are being addressed but the root causes are not being addressed or it is at the beginning of being addressed. Addressing the root causes of terrorism, as I have said, should be first political, it should be cultural, it should be media, informative, security and intelligence addressed. And the terrorism works as a network; it doesn’t have a certain head whether it is a person or an organisation. It is a network, terrorism is a network that could be found anywhere, and therefore combating terrorism and fighting its causes should come through international co-operation and not through having one side or one country that fights terrorism. Terrorism is there everywhere and therefore combating terrorism should be done by every country in the world. We spoke about peace in the Middle East. As we say always, Syria did not change its stand towards peace. Reaching a just and comprehensive peace in the region was always our principle, despite all the difficult circumstances, despite all the setbacks that the peace process has suffered from, the Syrian stand towards peace has not changed because it is a strategic position and not a tactical position, but Israel as far as we are concerned, is proving every day that it is against this peace, and therefore the desire for peace cannot coincide with the desire for killing. 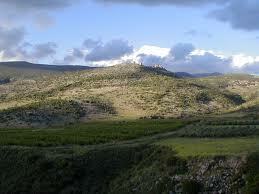 The list for assassinations cannot be an expression of a desire to reach peace and stability in this region. We also spoke in the peace process about the international consensus in the world, especially after 11 September events, about the necessity of achieving peace in the Middle Eastern region, and I said that this international consensus is a golden opportunity that might not be repeated in the future. It is an opportunity for the world, but it is to a large extent an opportunity for the American administration that could move without taking into account the domestic pressure that might influence its neutral role as co-sponsor of the peace process. We did not differentiate in our talk (inaudible) that peace and terrorism. Some people linked the issue of the Middle East to terrorism directly and it is understood as if the Middle East is a source of terrorism, and this is not correct. Despite our point of view as Arabs, because Israel is practising the state terrorism regularly and this is definite, but the Middle Eastern region often influences activating terrorism, because terrorists always need a cover. This cover could be a national issue, it could be a pan-national issue, it could be a social issue, and therefore closing the hot areas in the world will deprive these terrorists of the cover they always seek. Of course we — and the last point I would like to say about peace is that in Syria we cannot see with one eye as some people see. We cannot separate the issue of terrorism that we see every day and we live every day that Israel is practising against the Palestinians. We cannot separate between this kind of terrorism and the terrorism that is taking place in the world, and we can’t really look with one eye. Some people see with one eye, some people see with closed eyes and we cannot, we look at the issues with wide-open eyes in order to see what has taken place, and in order to see things from a very realistic perspective. And therefore no one can say small details can see small details without seeing the big issues, and the closer issues. People in the Arab region, and in the Muslim world cannot see the international terrorism without seeing Israeli terrorism, and therefore addressing this kind of terrorism is one. Some people say that achieving peace will make a big step for combating terrorism, this is correct. But also combating terrorism in Israel would help to reach (5 second break in audio) highly appreciate what I have heard from Mr. Prime Minister, because of his high appreciation and his great respect to Islam as a religion, and his high respect to the Muslim people in Britain. I am going to leave the floor to Mr Prime Minister to address you. On behalf of the Syrian Arab people, on my own behalf and on behalf of the Government of the Syrian Arab Republic, I warmly welcome Your Holiness and I whish You a happy stay in our country, which enjoys your visit. 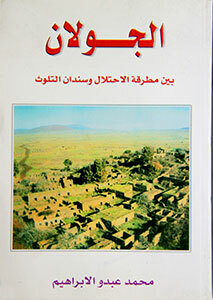 While visiting Syria you are treading the land of history, the homeland which hosted the most ancient civilizations in the world, and was a beacon which spread its light towards humanity throughout many centuries during which most regions of the world obtained guidance from its light. From Syria, which protect Christianity after Jesus Christ, Apostle Paul proceeded, preaching, with the other Disciples of Christ, the new religion in various parts of the world and calling for fraternity, justice and equality. 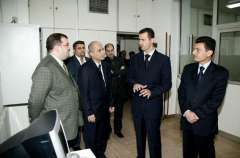 "We have never been aggressors against Israel; We, however, have ever been attacked by Israel,'' President Bashar Assad declared. "The Israelis are afraid of the past with its historical perspective hence they have no history where they have never exist in this region,'' His Excellency added in his historic address to Arab Summit here today. 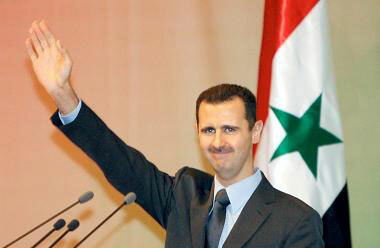 President Assad noted that the Israelis very well know that they '' don't own this land, which is possessed by Arabs''. The President ridiculed the Israeli claims for security asserting that '' the person on whom aggression falls should seek security. 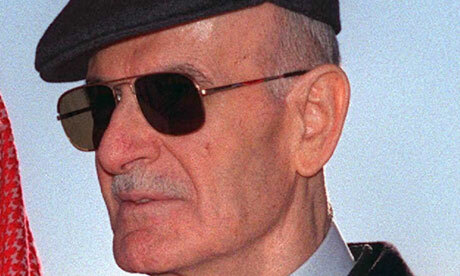 We have to make sure that Israel would never launch an aggression against us, bombard an institution in Iraq, or assassinate an official in Tunisia or in Malta,'' in reference to the Israeli many committed crimes against Arabs "There would never be a peace without the retaining of the land in full and without the security of each Arab citizen,'' the President underlined. His Excellency belittled the Israeli threats against Syria, Lebanon or against other Arab countries saying that the Israelis '' through their military solutions move from a failure to another'' ,'' The Israelis, furthermore, didn't forget their defeat in Lebanon at the hands of the Lebanese Resistance in less than a year,'' HE called for a closer look at the Israeli public opinion '' The Israelis killed Rabin, when they suspected that he would offer something for peace, a mere suspense made them kill him though he was the hero in breaking the Palestinians' bones during the first Intifada,'' "As Arabs we consider all the Israelis right-wingers,'' HE said recalling '' Peres's present to the Israeli p[public opinion through Qana Massacre' '' Barak presented more than 400 Palestinian martyrs,'' "We are never concerned with names, Sharon, internationally renowned as the man of massacres, killing and hatred against Arabs, hates every Arab-related thing, Sharon was elected by the Israeli street itself.'' ''The reality of the Israeli public opinion should be probed; Israel is a racial society and a more racist one than the Nazism,'' President Assad called on Arabs '' as not to fall in the trap of linking our stances and policies on our causes to those on persons in Israel or among the Israeli street,'' "Every single Israeli is responsible for each span of the occupied Arab territories and for every Arab to be killed,'' President Assad added.